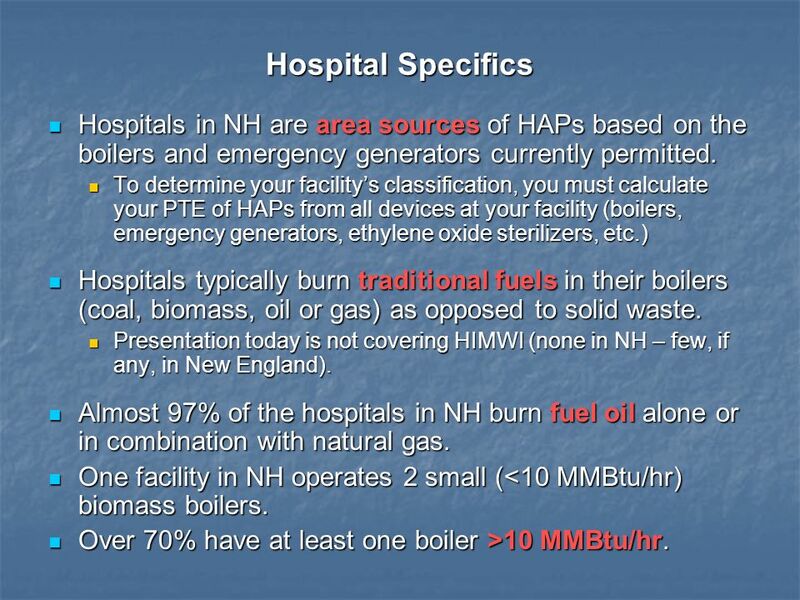 5 Hospital Specifics Hospitals in NH are area sources of HAPs based on the boilers and emergency generators currently permitted. To determine your facility’s classification, you must calculate your PTE of HAPs from all devices at your facility (boilers, emergency generators, ethylene oxide sterilizers, etc.) Hospitals typically burn traditional fuels in their boilers (coal, biomass, oil or gas) as opposed to solid waste. Presentation today is not covering HIMWI (none in NH – few, if any, in New England). 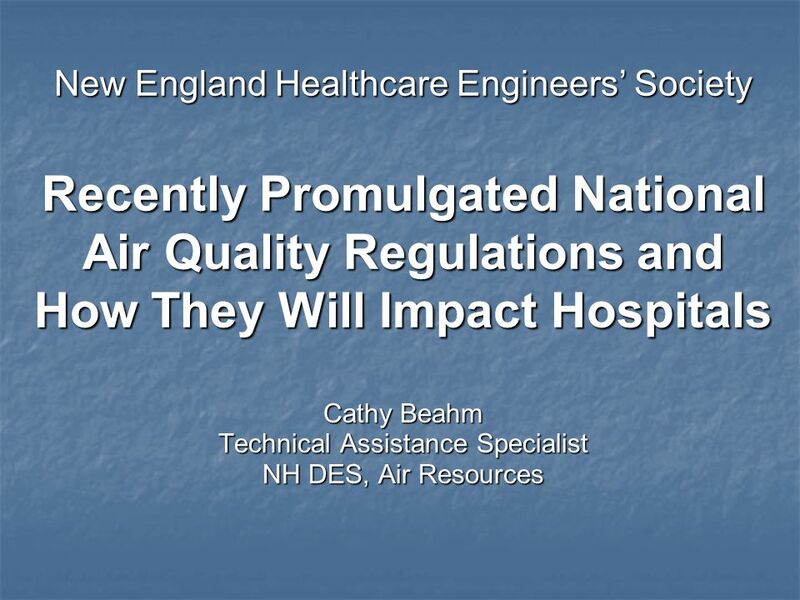 Almost 97% of the hospitals in NH burn fuel oil alone or in combination with natural gas. One facility in NH operates 2 small (<10 MMBtu/hr) biomass boilers. Over 70% have at least one boiler >10 MMBtu/hr. 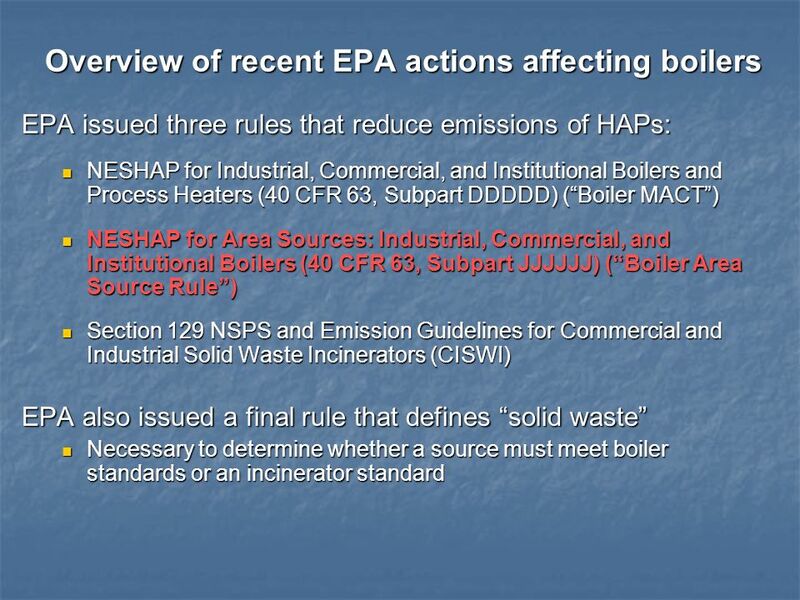 EPA issued three rules that reduce emissions of HAPs: NESHAP for Industrial, Commercial, and Institutional Boilers and Process Heaters (40 CFR 63, Subpart DDDDD) (“Boiler MACT”) NESHAP for Area Sources: Industrial, Commercial, and Institutional Boilers (40 CFR 63, Subpart JJJJJJ) (“Boiler Area Source Rule”) Section 129 NSPS and Emission Guidelines for Commercial and Industrial Solid Waste Incinerators (CISWI) EPA also issued a final rule that defines “solid waste” Necessary to determine whether a source must meet boiler standards or an incinerator standard Explain delegation issue and the lead agency on each rule. 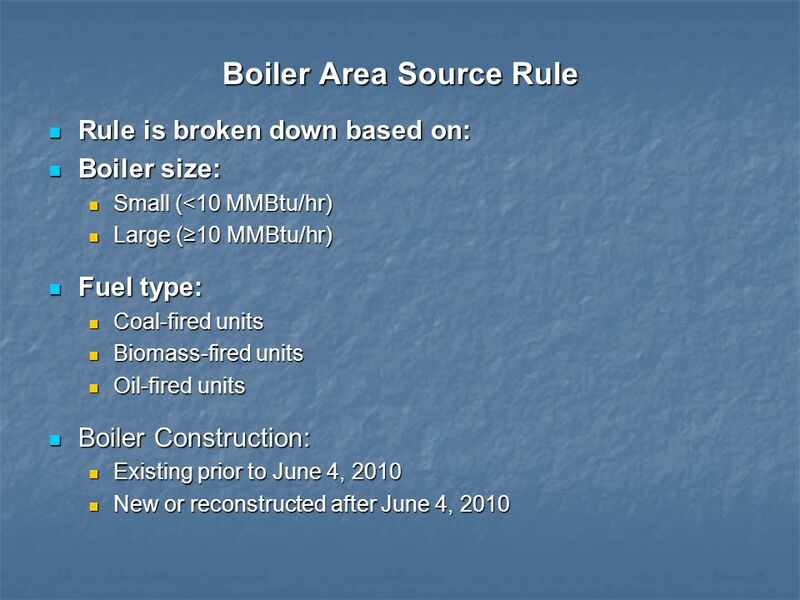 Rule is broken down based on: Boiler size: Small (<10 MMBtu/hr) Large (≥10 MMBtu/hr) Fuel type: Coal-fired units Biomass-fired units Oil-fired units Boiler Construction: Existing prior to June 4, 2010 New or reconstructed after June 4, 2010 Note: NH has not taken delegation of the Boiler Area Source Rule. 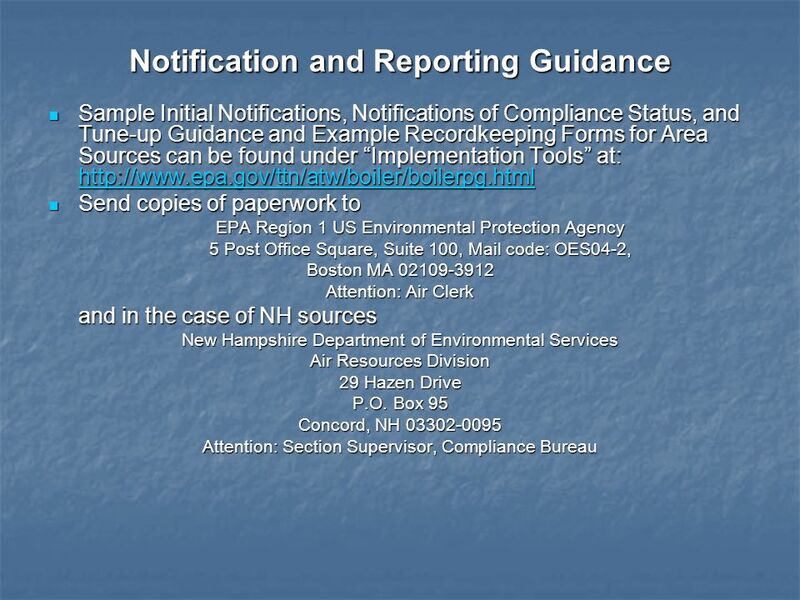 Therefore, the information presented here is based on the regulation and conversations that have taken place with EPA, Headquarters and Region 1, and are in some cases based on interpretations by EPA and DES as we have tried to work through various issues not clearly defined in the existing rule. In addition, any requirements in the existing rule may be changed in the future as a result of the reconsideration process. It is up to the source to review the regulation as it pertains to their specific situation, comply with the regulation as promulgated and keep informed of any changes. 11 Are any boilers not subject to this subpart? Any boiler covered by another part of 40 CFR 63 Any boiler covered by CISWI Hazardous waste boilers A boiler that is used specifically for research and development. 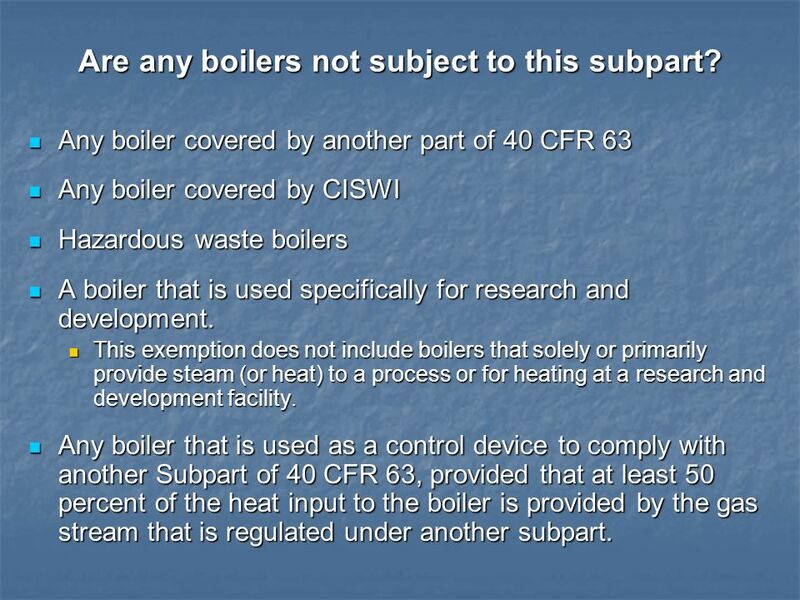 This exemption does not include boilers that solely or primarily provide steam (or heat) to a process or for heating at a research and development facility. Any boiler that is used as a control device to comply with another Subpart of 40 CFR 63, provided that at least 50 percent of the heat input to the boiler is provided by the gas stream that is regulated under another subpart. 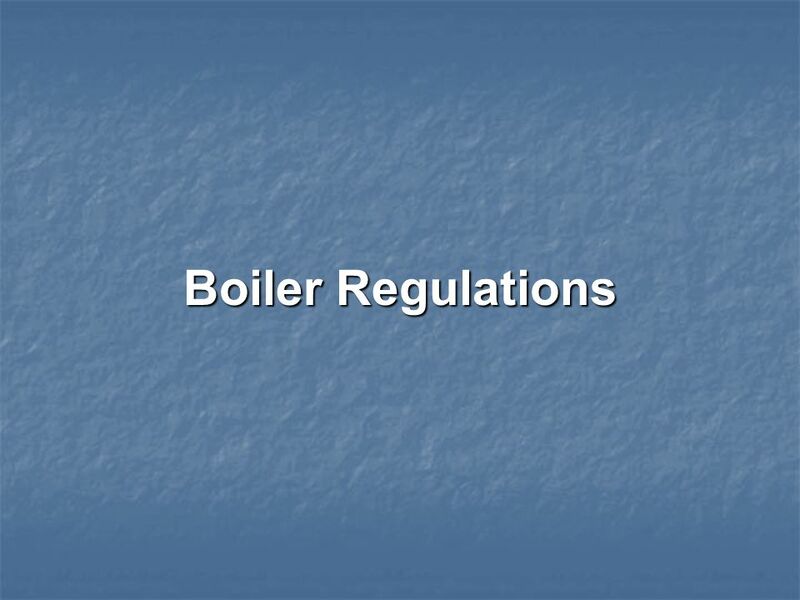 Key points: Gas-fired boilers (as defined) are not subject to the Area Source Boiler Rule. Dual fired boilers (e.g. 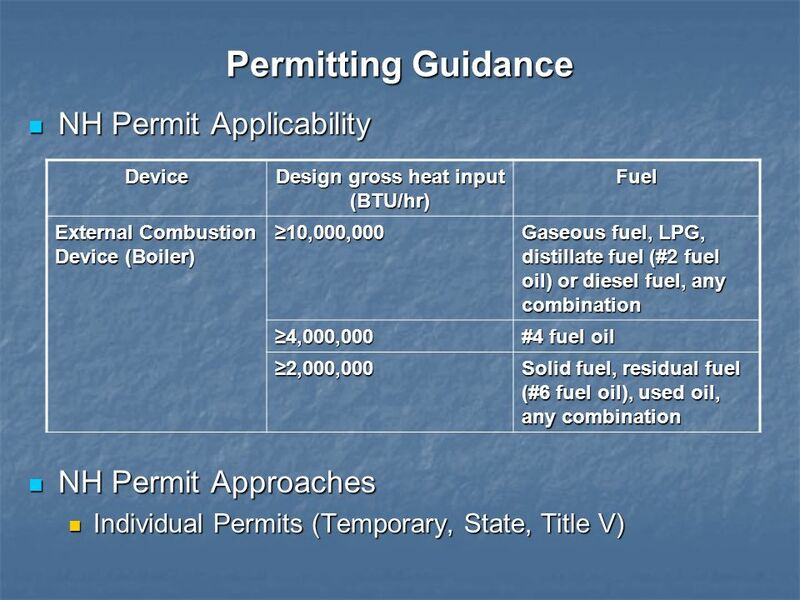 NG/#2 FO) that don’t meet or are unwilling to meet the gas-fired boiler definition would be subject to the rule when burning liquid fuel. 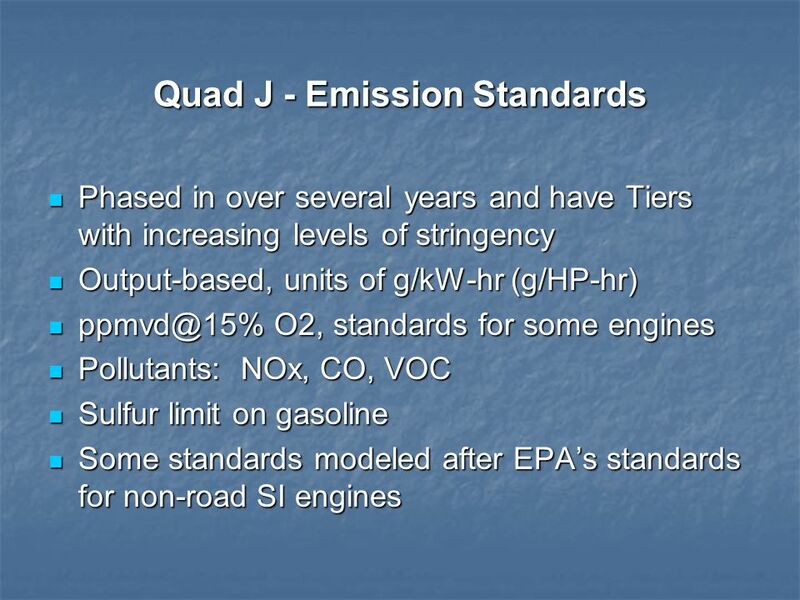 (Existing: work practice standards; New: emission limitations and work practice standards) If a gas-fired boiler switches to dual fuel or liquid fuel only in the future, this constitutes fuel switching and the device would be considered “new”. 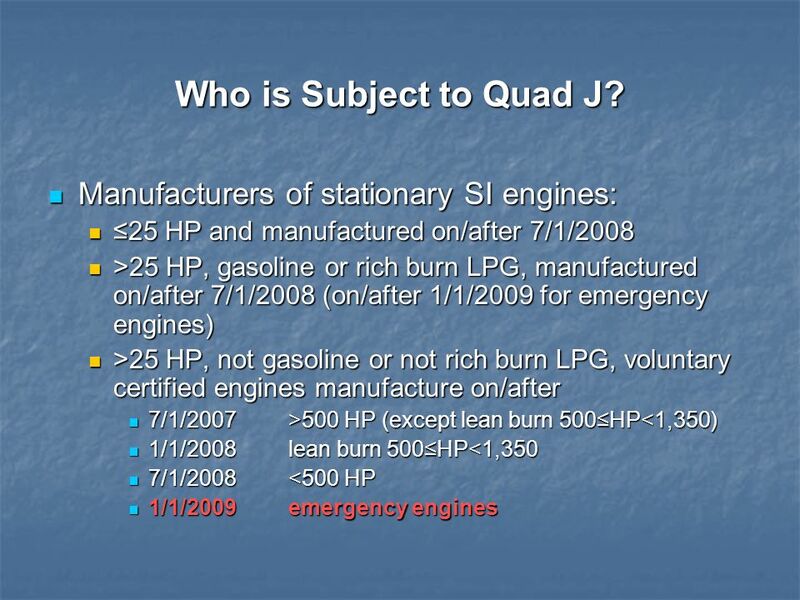 At that point, the device would have to meet the oil-fired emission limit as well as tune-up. A hot water heater as defined in this subpart. Hot water heater means a closed vessel with a capacity of no more than 120 U.S. gallons in which water is heated by combustion of gaseous or liquid fuel and is withdrawn for use external to the vessel at pressures not exceeding 160 psig, … and … water temperatures exceeding 210°F. A gas-fired boiler as defined in this subpart. Gas-fired boiler includes any boiler that burns gaseous fuels not combined with any solid fuels, burns liquid fuel only during periods of gas curtailment, gas supply emergencies, or periodic testing on liquid fuel. 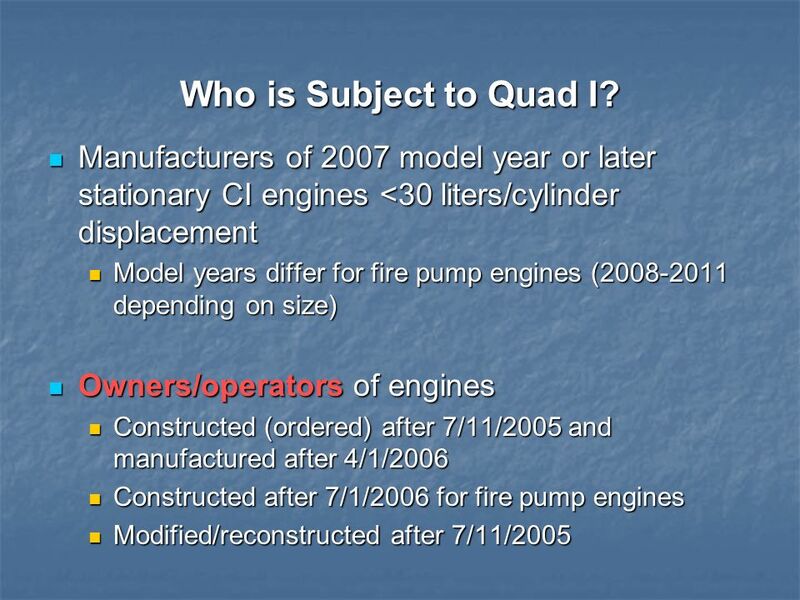 Periodic testing of liquid fuel shall not exceed a combined total of 48 hours during any calendar year. 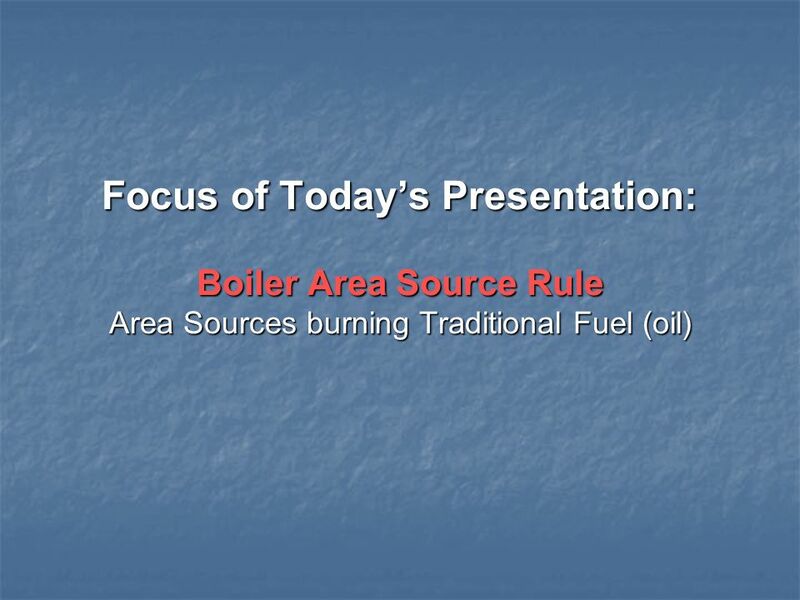 Key points: Gas-fired boilers (as defined) are not subject to the Area Source Boiler Rule. Dual fired boilers (e.g. 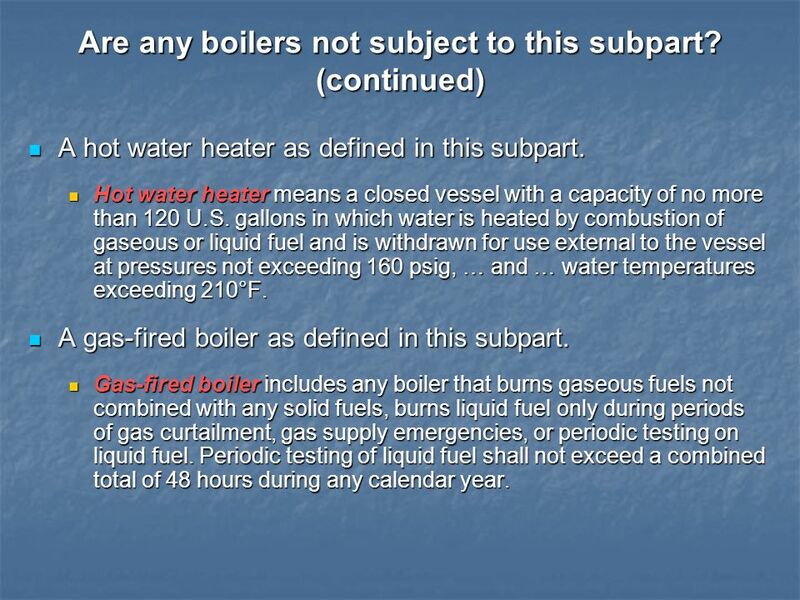 NG/#2 FO) that don’t meet or are unwilling to meet the gas-fired boiler definition would be subject to the rule when burning liquid fuel. (Existing: work practice standards; New: emission limitations and work practice standards) If a gas-fired boiler switches to dual fuel or liquid fuel only in the future, this constitutes fuel switching and the device would be considered “new”. At that point, the device would have to meet the oil-fired emission limit as well as tune-up. A boiler is a new affected source if you commenced fuel switching from natural gas to solid fossil fuel, biomass, or liquid fuel after June 4, 2010. 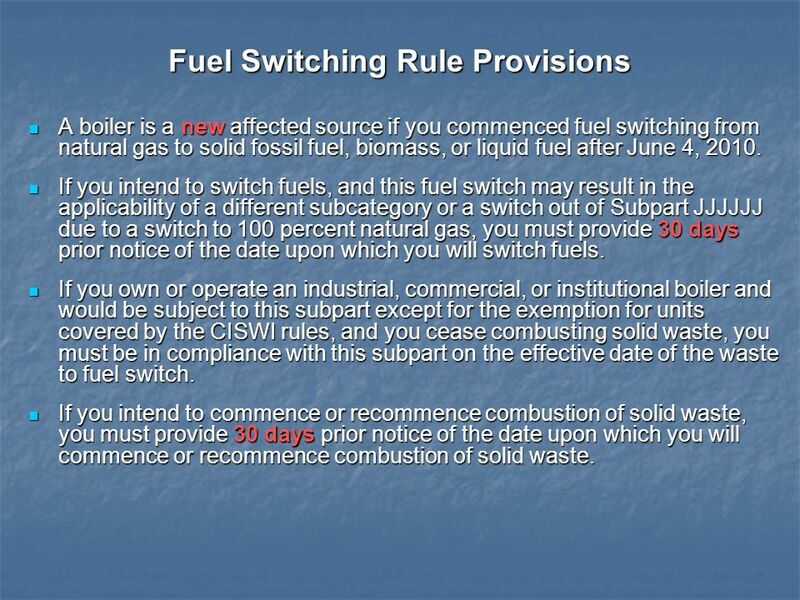 If you intend to switch fuels, and this fuel switch may result in the applicability of a different subcategory or a switch out of Subpart JJJJJJ due to a switch to 100 percent natural gas, you must provide 30 days prior notice of the date upon which you will switch fuels. 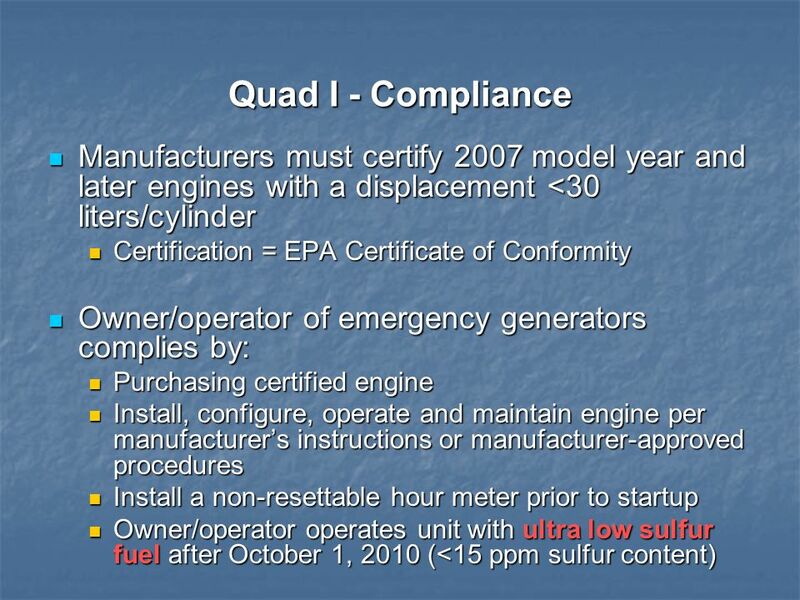 If you own or operate an industrial, commercial, or institutional boiler and would be subject to this subpart except for the exemption for units covered by the CISWI rules, and you cease combusting solid waste, you must be in compliance with this subpart on the effective date of the waste to fuel switch. If you intend to commence or recommence combustion of solid waste, you must provide 30 days prior notice of the date upon which you will commence or recommence combustion of solid waste. 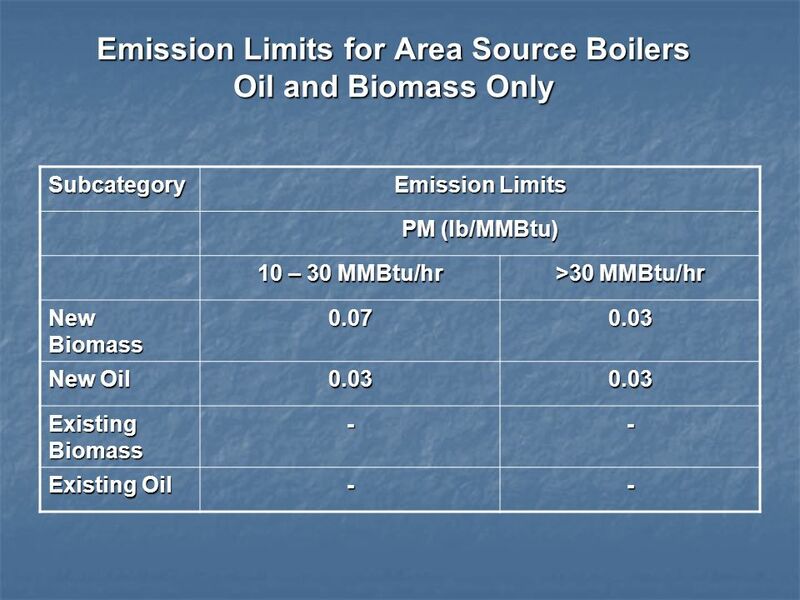 Subcategory Emission Limits PM (lb/MMBtu) 10 – 30 MMBtu/hr >30 MMBtu/hr New Biomass 0.07 0.03 New Oil Existing Biomass - Existing Oil Note: The emission limit of 0.03 lb/MMBtu limit for PM from new devices is the same emission limit in the NSPS for new >30 MMBtu/hr boilers. One-time energy assessment performed by a qualified energy assessor. 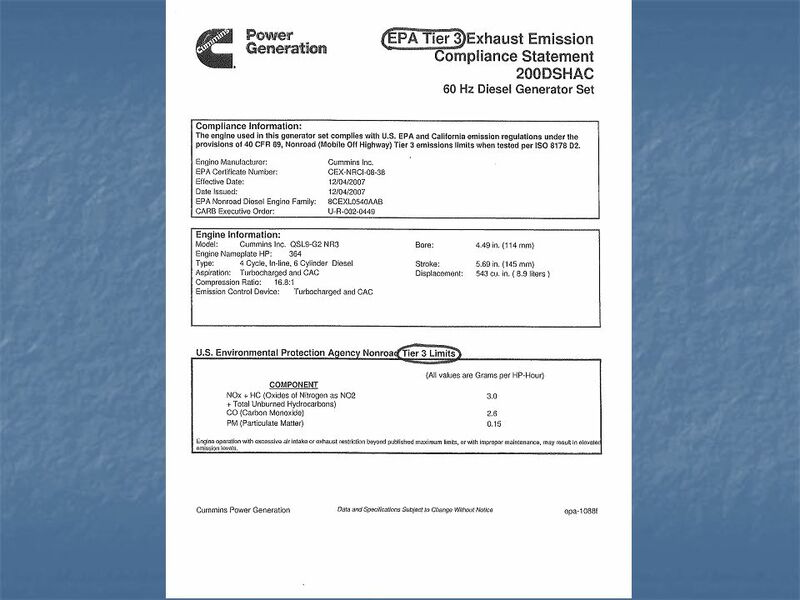 An energy assessment completed on or after January 1, 2008, that meets or is amended to meet the energy assessment requirements satisfies the energy assessment requirements. 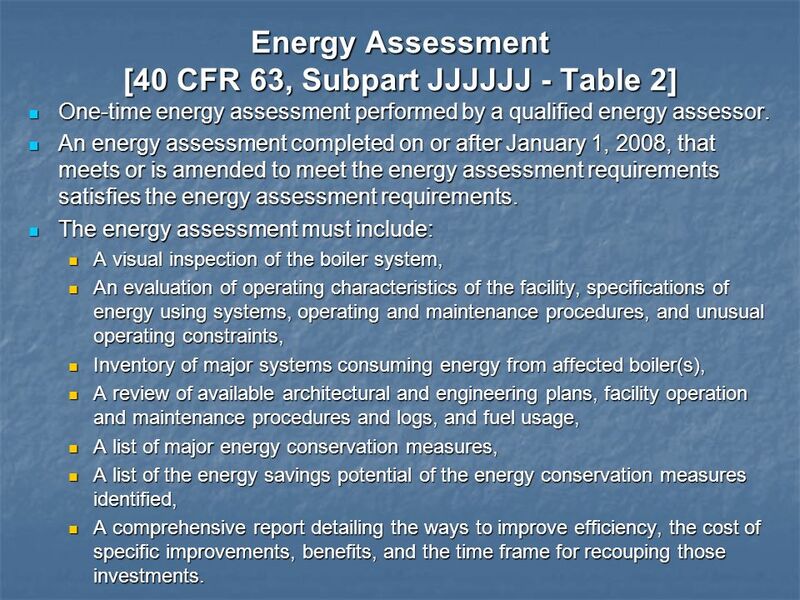 The energy assessment must include: A visual inspection of the boiler system, An evaluation of operating characteristics of the facility, specifications of energy using systems, operating and maintenance procedures, and unusual operating constraints, Inventory of major systems consuming energy from affected boiler(s), A review of available architectural and engineering plans, facility operation and maintenance procedures and logs, and fuel usage, A list of major energy conservation measures, A list of the energy savings potential of the energy conservation measures identified, A comprehensive report detailing the ways to improve efficiency, the cost of specific improvements, benefits, and the time frame for recouping those investments. 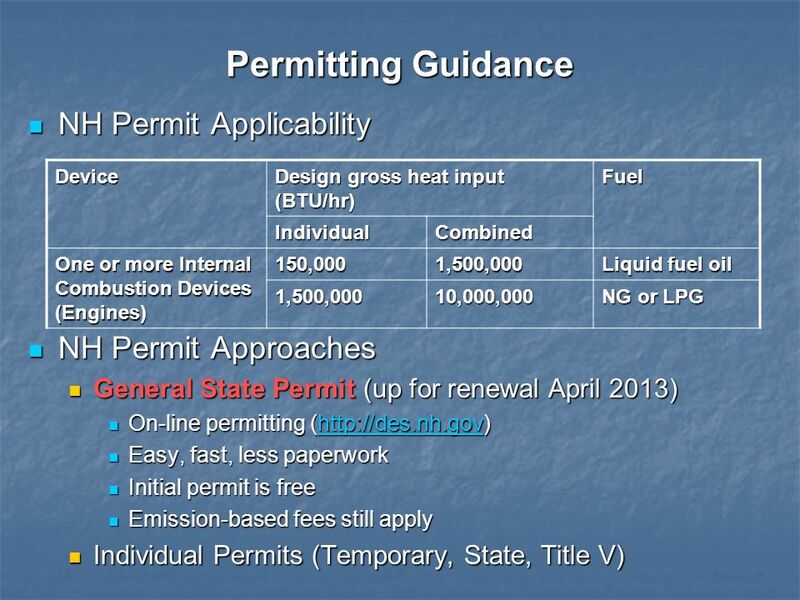 EPA is hoping to come out with more detailed guidance on the energy assessment portion of the rule soon. NH DES is also going to be conducting Workshops on the rules and expanding the website with information and links to documents to aid facilities in complying with the rules, including but not limited to lists of qualified energy assessors, notification forms, Fact Sheets and Frequently Asked Questions. As applicable, inspect the burner, and clean or replace any components of the burner as necessary (you may delay the burner inspection until the next scheduled unit shutdown, but you must inspect each burner at least once every 36 months). 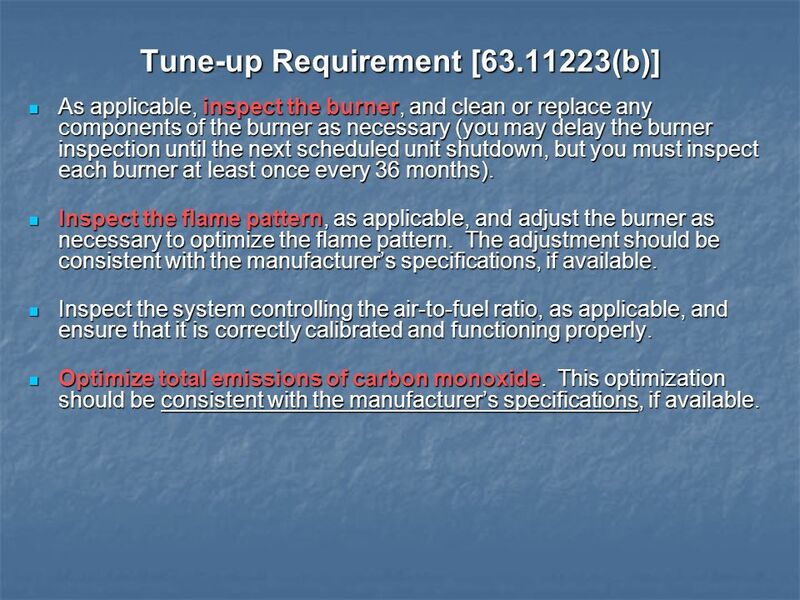 Inspect the flame pattern, as applicable, and adjust the burner as necessary to optimize the flame pattern. The adjustment should be consistent with the manufacturer’s specifications, if available. Inspect the system controlling the air-to-fuel ratio, as applicable, and ensure that it is correctly calibrated and functioning properly. Optimize total emissions of carbon monoxide. This optimization should be consistent with the manufacturer’s specifications, if available. Measure the concentrations in the effluent stream of carbon monoxide in parts per million, by volume, and oxygen in volume percent, before and after the adjustments are made (measurements may be either on a dry or wet basis, as long as it is the same basis before and after the adjustments are made). Maintain onsite and submit, if requested, biennial report containing the following information: The concentration of CO in the effluent stream in ppm, by volume, and oxygen in volume percent, measured before and after the tune-up of the boiler. 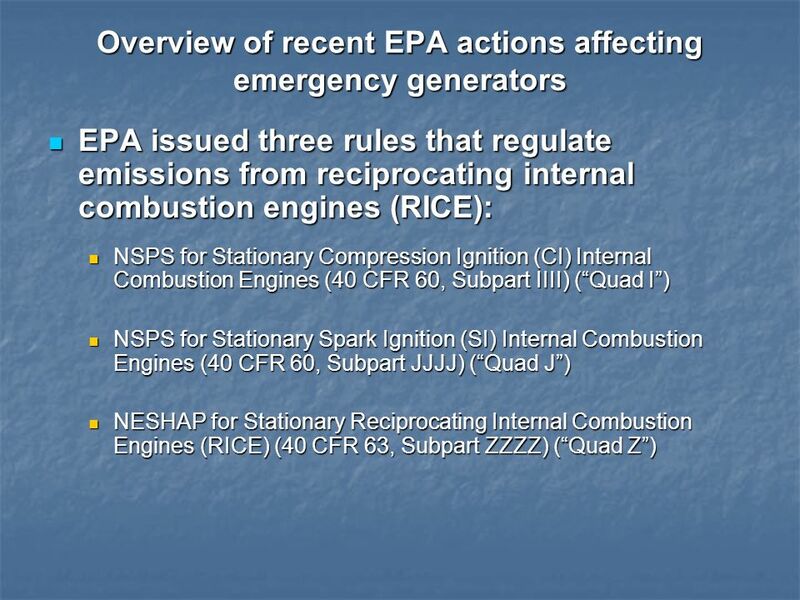 A description of any corrective actions taken as a part of the tune-up of the boiler. The type and amount of fuel used over the 12 months prior to the biennial tune-up of the boiler. 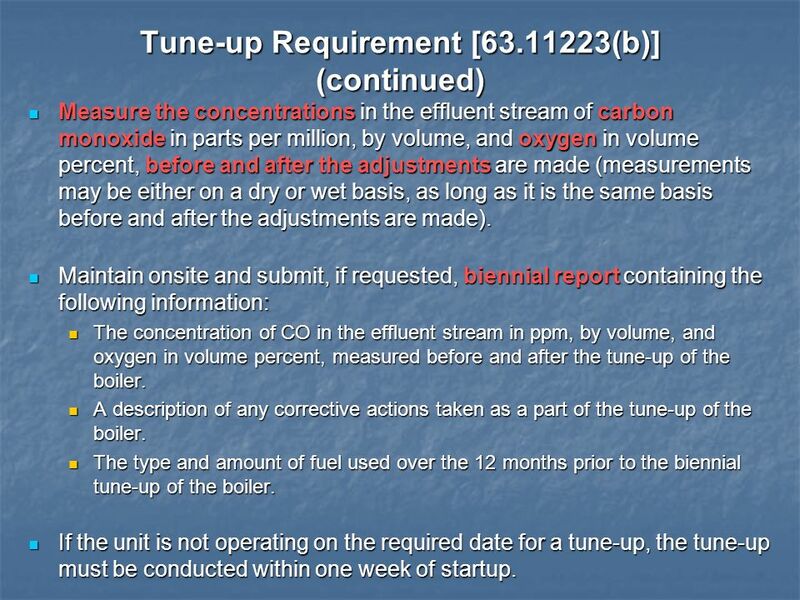 If the unit is not operating on the required date for a tune-up, the tune-up must be conducted within one week of startup. 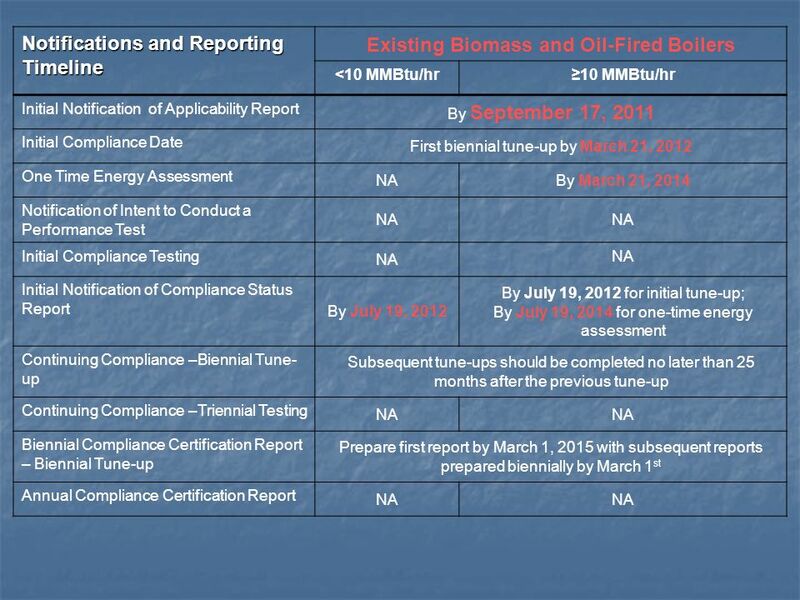 Notifications and Reporting Timeline Existing Biomass and Oil-Fired Boilers <10 MMBtu/hr ≥10 MMBtu/hr Initial Notification of Applicability Report By September 17, 2011 Initial Compliance Date First biennial tune-up by March 21, 2012 One Time Energy Assessment NA By March 21, 2014 Notification of Intent to Conduct a Performance Test Initial Compliance Testing Initial Notification of Compliance Status Report By July 19, 2012 By July 19, 2012 for initial tune-up; By July 19, 2014 for one-time energy assessment Continuing Compliance –Biennial Tune-up Subsequent tune-ups should be completed no later than 25 months after the previous tune-up Continuing Compliance –Triennial Testing Biennial Compliance Certification Report – Biennial Tune-up Prepare first report by March 1, 2015 with subsequent reports prepared biennially by March 1st Annual Compliance Certification Report Sample Initial Notifications and Notification of Compliance Status forms are located on the EPA and DES websites. 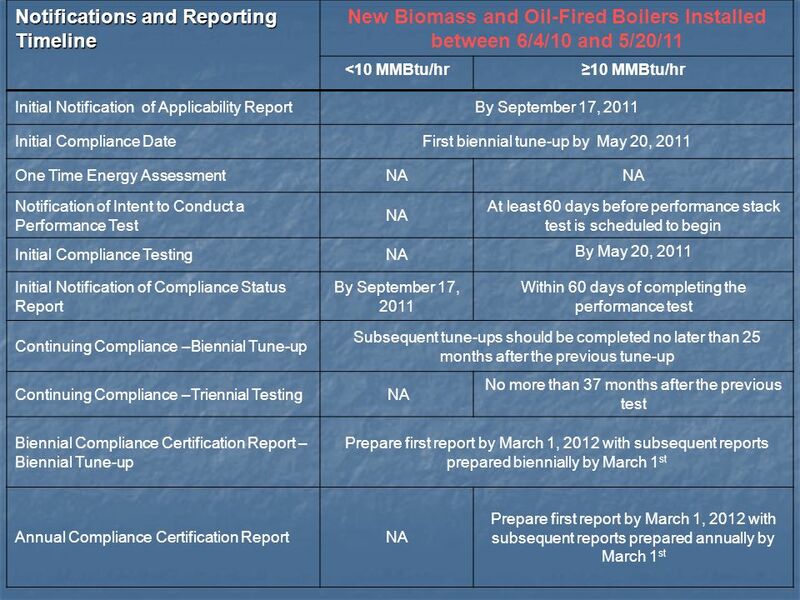 Notifications and Reporting Timeline New Biomass and Oil-Fired Boilers Installed between 6/4/10 and 5/20/11 <10 MMBtu/hr ≥10 MMBtu/hr Initial Notification of Applicability Report By September 17, 2011 Initial Compliance Date First biennial tune-up by May 20, 2011 One Time Energy Assessment NA Notification of Intent to Conduct a Performance Test At least 60 days before performance stack test is scheduled to begin Initial Compliance Testing By May 20, 2011 Initial Notification of Compliance Status Report Within 60 days of completing the performance test Continuing Compliance –Biennial Tune-up Subsequent tune-ups should be completed no later than 25 months after the previous tune-up Continuing Compliance –Triennial Testing No more than 37 months after the previous test Biennial Compliance Certification Report – Biennial Tune-up Prepare first report by March 1, 2012 with subsequent reports prepared biennially by March 1st Annual Compliance Certification Report Prepare first report by March 1, 2012 with subsequent reports prepared annually by March 1st Sample Initial Notifications and Notification of Compliance Status forms are located on the EPA and DES websites. 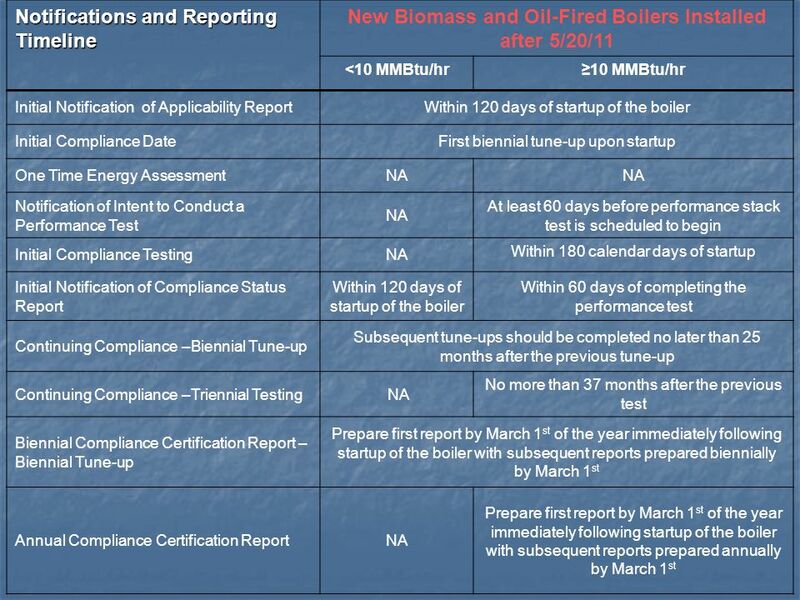 Notifications and Reporting Timeline New Biomass and Oil-Fired Boilers Installed after 5/20/11 <10 MMBtu/hr ≥10 MMBtu/hr Initial Notification of Applicability Report Within 120 days of startup of the boiler Initial Compliance Date First biennial tune-up upon startup One Time Energy Assessment NA Notification of Intent to Conduct a Performance Test At least 60 days before performance stack test is scheduled to begin Initial Compliance Testing Within 180 calendar days of startup Initial Notification of Compliance Status Report Within 60 days of completing the performance test Continuing Compliance –Biennial Tune-up Subsequent tune-ups should be completed no later than 25 months after the previous tune-up Continuing Compliance –Triennial Testing No more than 37 months after the previous test Biennial Compliance Certification Report – Biennial Tune-up Prepare first report by March 1st of the year immediately following startup of the boiler with subsequent reports prepared biennially by March 1st Annual Compliance Certification Report Prepare first report by March 1st of the year immediately following startup of the boiler with subsequent reports prepared annually by March 1st Sample Initial Notifications and Notification of Compliance Status forms are located on the EPA and DES websites. How do these three rules compare? 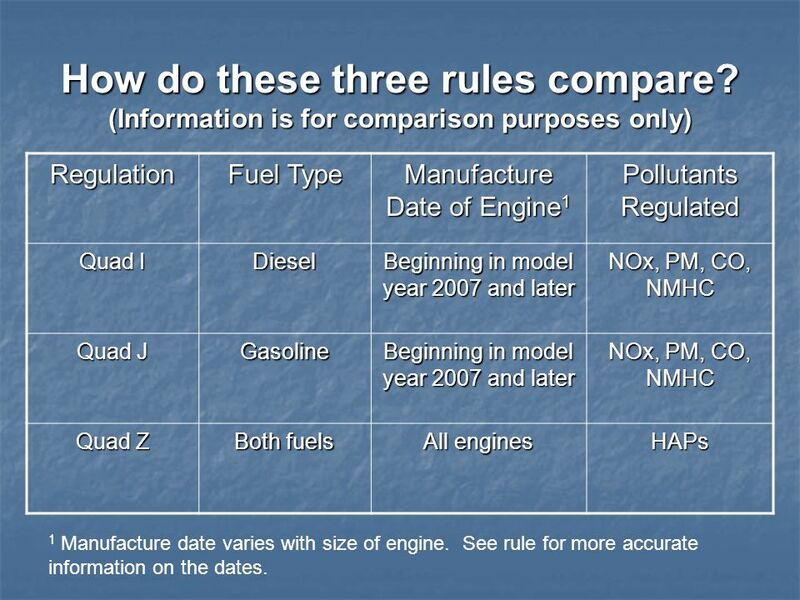 (Information is for comparison purposes only) Regulation Fuel Type Manufacture Date of Engine1 Pollutants Regulated Quad I Diesel Beginning in model year 2007 and later NOx, PM, CO, NMHC Quad J Gasoline Quad Z Both fuels All engines HAPs 1 Manufacture date varies with size of engine. See rule for more accurate information on the dates. 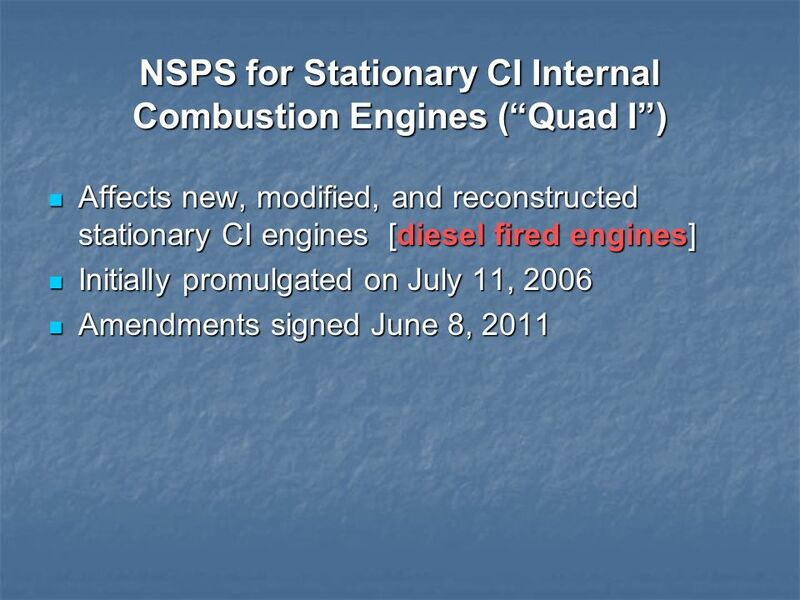 Affects new, modified, and reconstructed stationary CI engines [diesel fired engines] Initially promulgated on July 11, 2006 Amendments signed June 8, 2011 Applies to diesel engines (compression ignition). 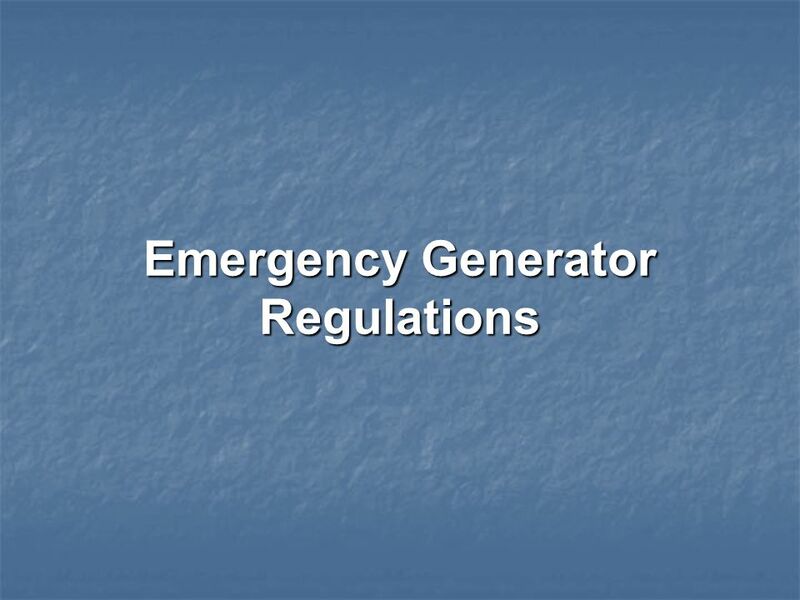 Emergency Generators not required to submit an initial notification. 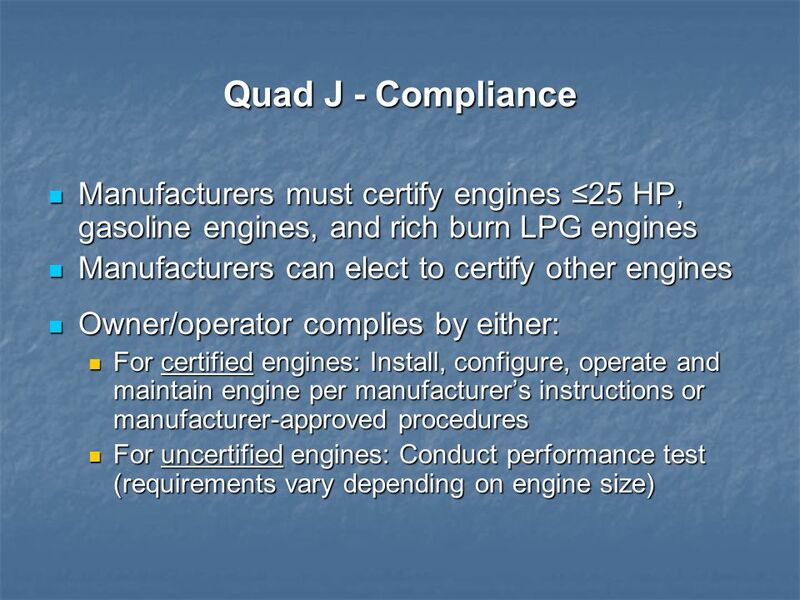 Maintain documentation from the manufacturer certifying that the engine complies with the applicable emission standards of Quad I Record the time of operation of the engine and the reason the engine was in operation during that time. 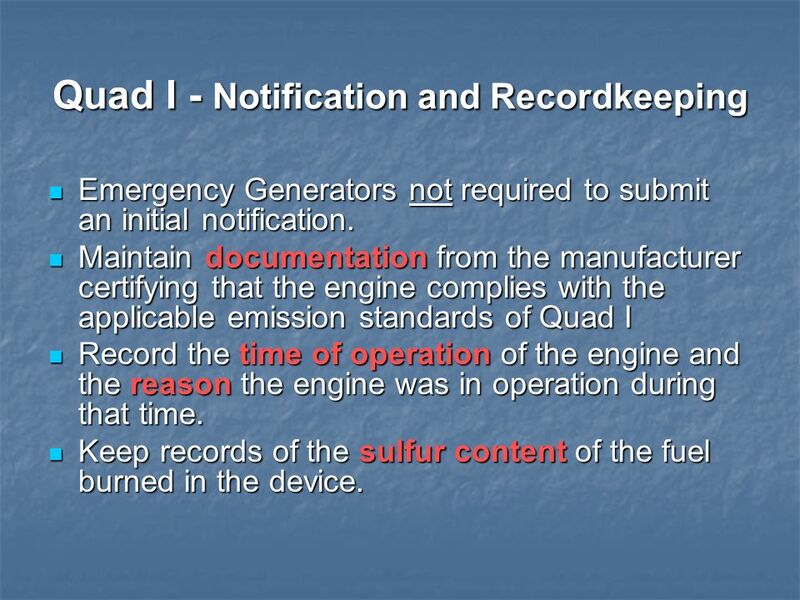 Keep records of the sulfur content of the fuel burned in the device. 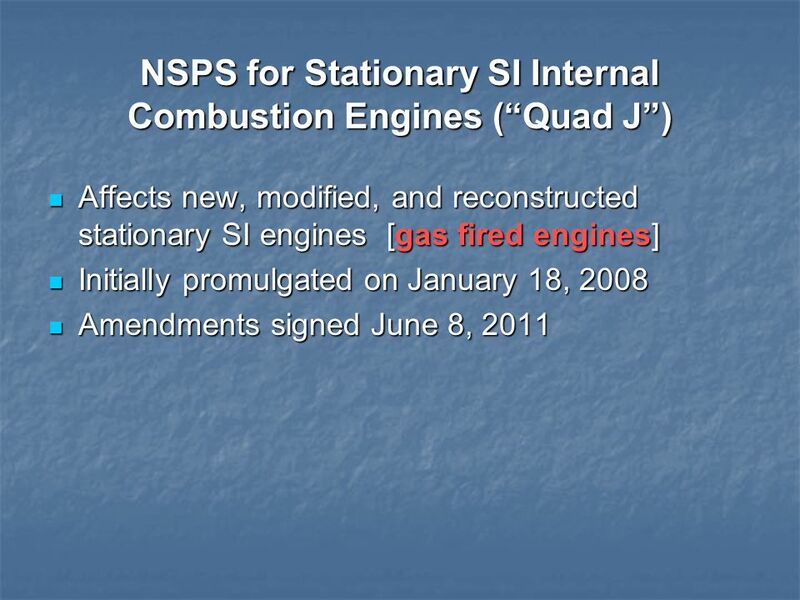 Affects new, modified, and reconstructed stationary SI engines [gas fired engines] Initially promulgated on January 18, 2008 Amendments signed June 8, 2011 Applies to gas fired engines (spark ignition). 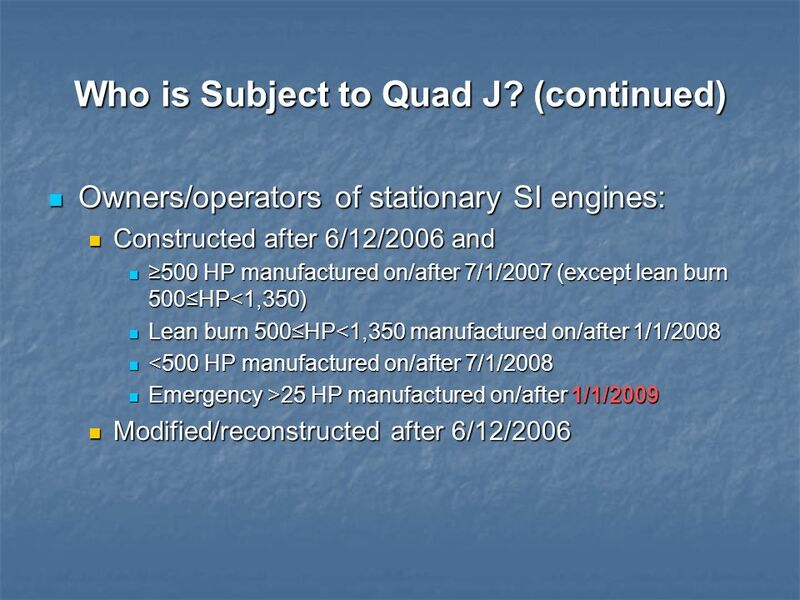 Owners/operators of uncertified SI RICE ≥500 HP must submit an initial notification. 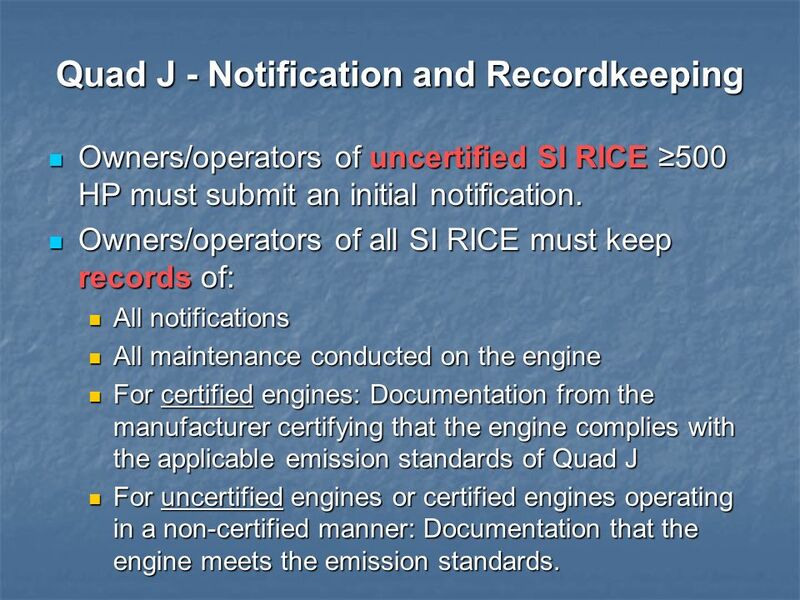 Owners/operators of all SI RICE must keep records of: All notifications All maintenance conducted on the engine For certified engines: Documentation from the manufacturer certifying that the engine complies with the applicable emission standards of Quad J For uncertified engines or certified engines operating in a non-certified manner: Documentation that the engine meets the emission standards. New or reconstructed stationary RICE located at an area source must meet the requirements of Quad I or Quad J. No further requirements apply under Quad Z. 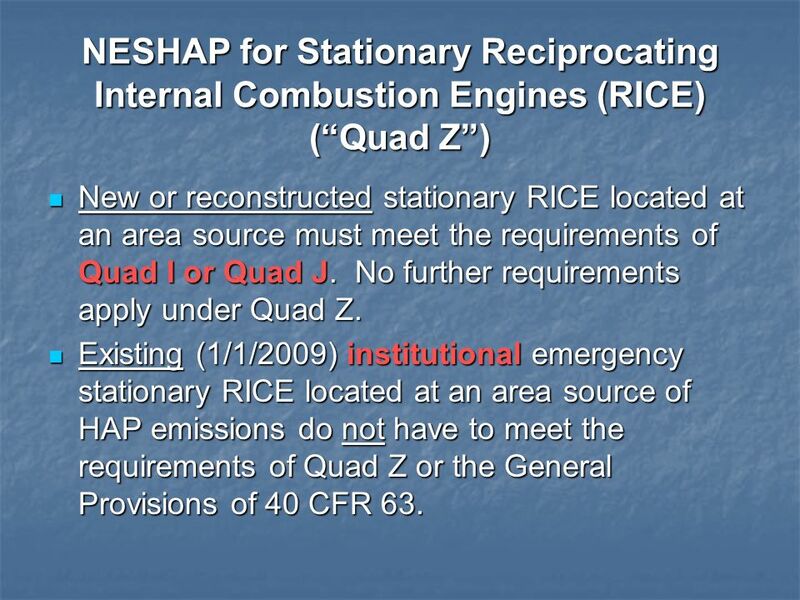 Existing (1/1/2009) institutional emergency stationary RICE located at an area source of HAP emissions do not have to meet the requirements of Quad Z or the General Provisions of 40 CFR 63. 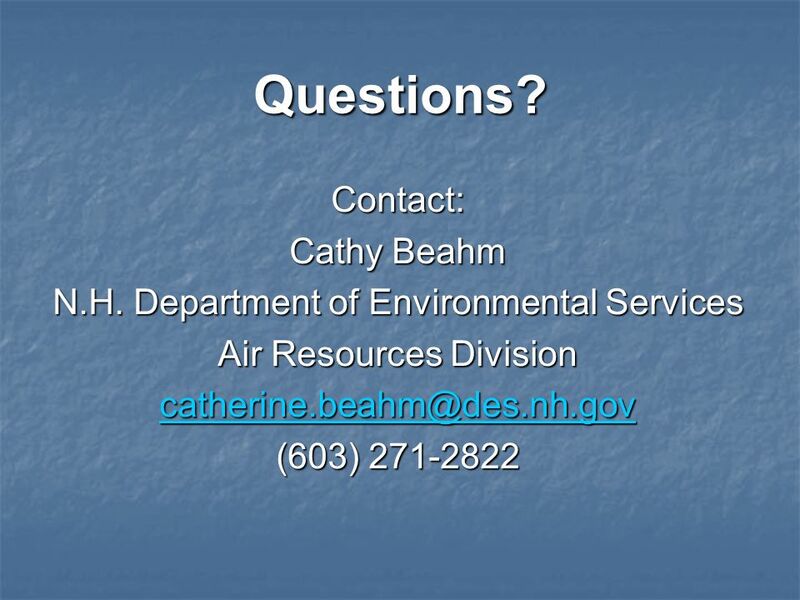 Download ppt "Cathy Beahm Technical Assistance Specialist NH DES, Air Resources"
METAL FURNITURE SURFACE COATING MACT OVERVIEW 40 CFR PART 63, SUBPART RRRR July 2006. METAL COIL SURFACE COATING MACT OVERVIEW 40 CFR PART 63, SUBPART SSSS May CFR PART 63, SUBPART SSSS May 2006. METAL CAN SURFACE COATING MACT OVERVIEW 40 CFR PART 63, SUBPART KKKK June CFR PART 63, SUBPART KKKK June 2006. METAL FURNITURE SURFACE COATING MACT QUESTION & ANSWERS 40 CFR PART 63, SUBPART RRRR July 2006. 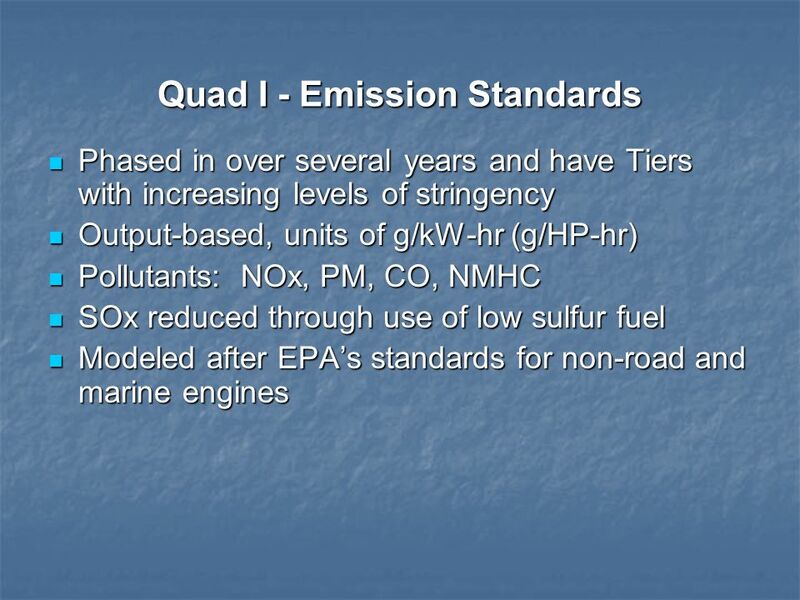 Reporting 2011 Emissions Inventories WELCOME! Major Facilities. Impacts of the New Boiler MACT Rules Les Oakes King & Spalding. 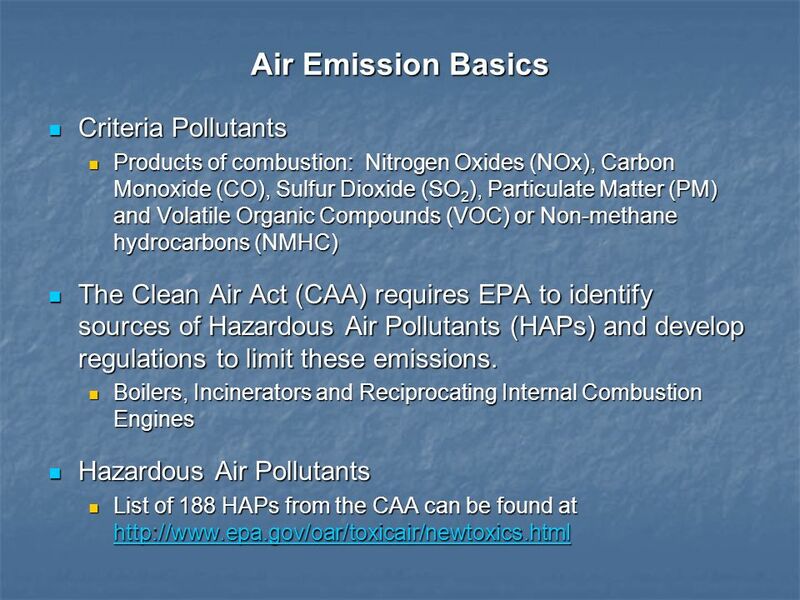 United States Experience: Hazardous Waste Combustion US Standards Controls Emissions. Healthcare and Air Quality H2E Conference - Dec 6, 2007 K-State Pollution Prevention Institute Ryan Hamel. 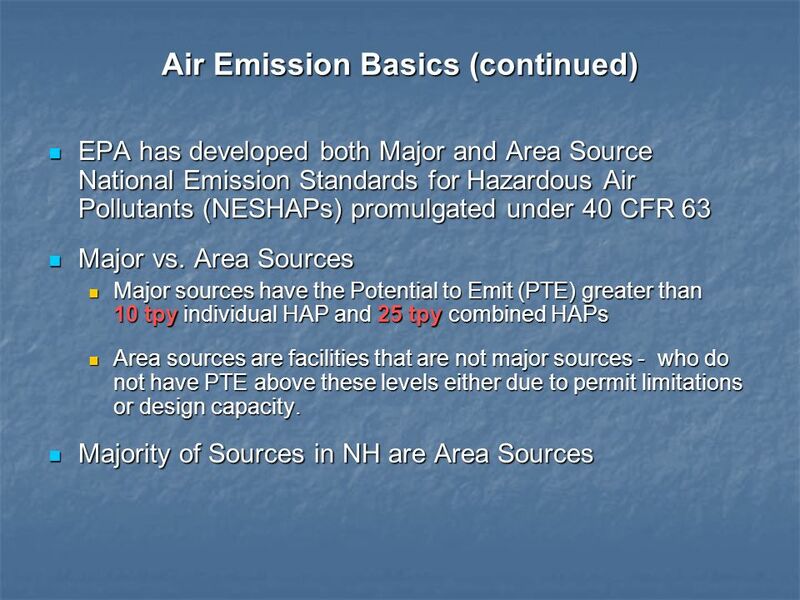 Part 63 Boiler Rule for Area Sources AWMA Conference September 11-14, 2012 Biloxi, MS Lee Page Air Toxics Assessment and Implementation Section U.S. Environmental. Delivering sustainable solutions in a more competitive world Proposed Area and Major Source Boiler NESHAP Overview David Dunn Environmental Resources Management. 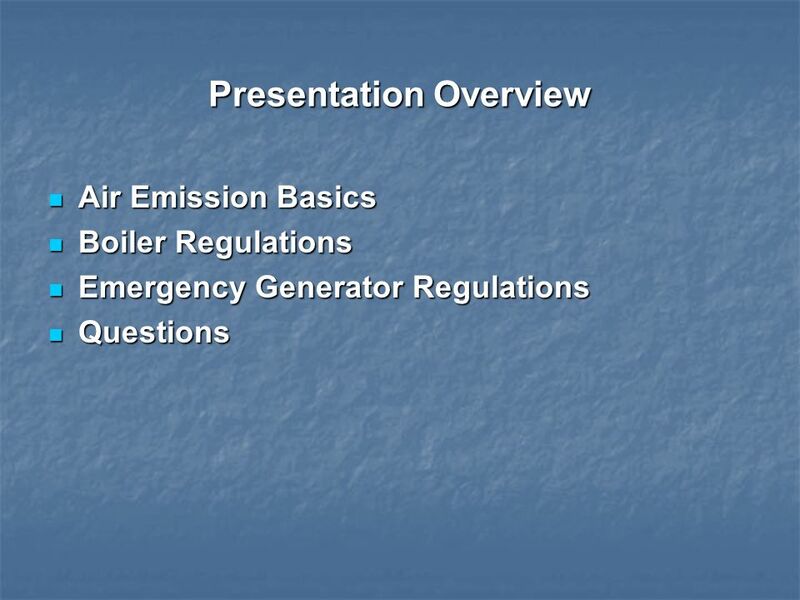 U.S. Environmental Protection Agency April 13, 2011 Final Rules to Reduce Air Toxics from Boilers. 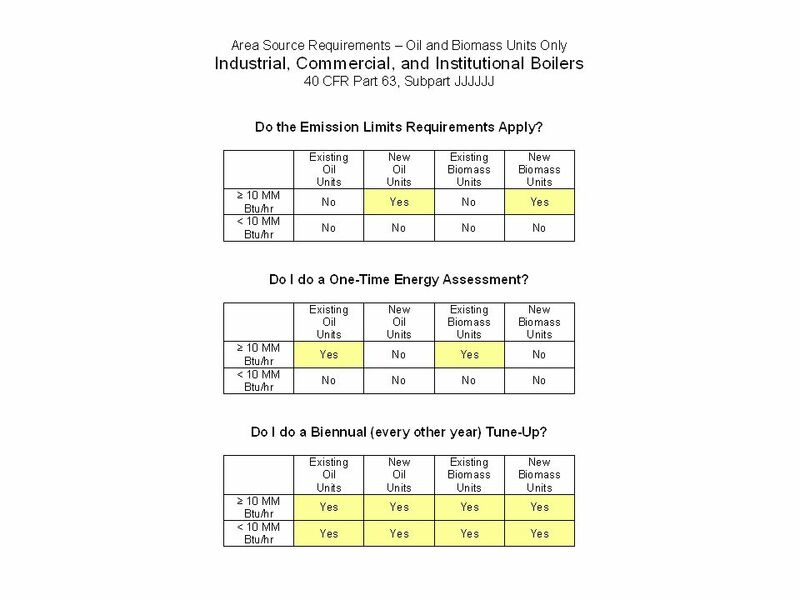 Adjustments to the Air Toxics Standards for Major and Area Source Boilers 40 CFR Part 63, Subparts DDDDD and JJJJJJ Summary of Final Changes, Key Highlights. 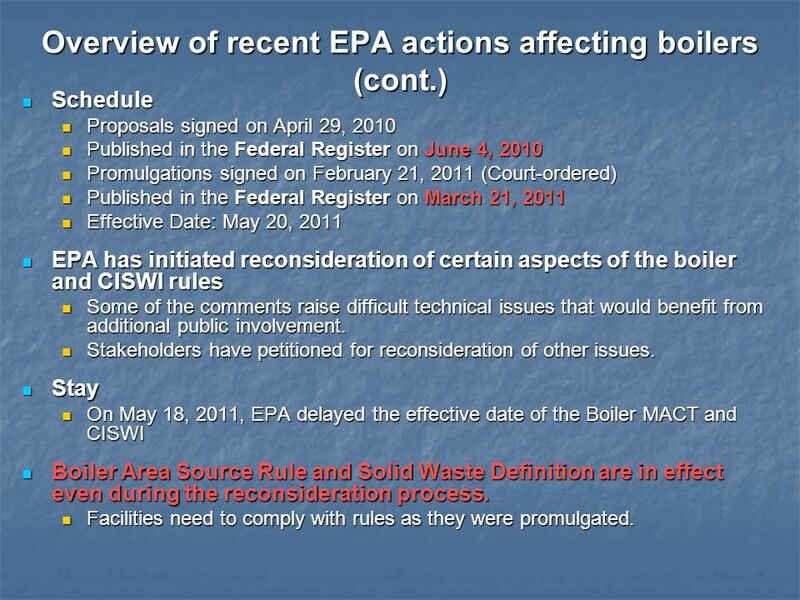 Non-Hazardous Secondary Materials Definition: How it Relates to Boiler MACT and CISWI Rules Biloxi, MS ♦ September 13, 2012 Melissa Hillman Justin Fickas. 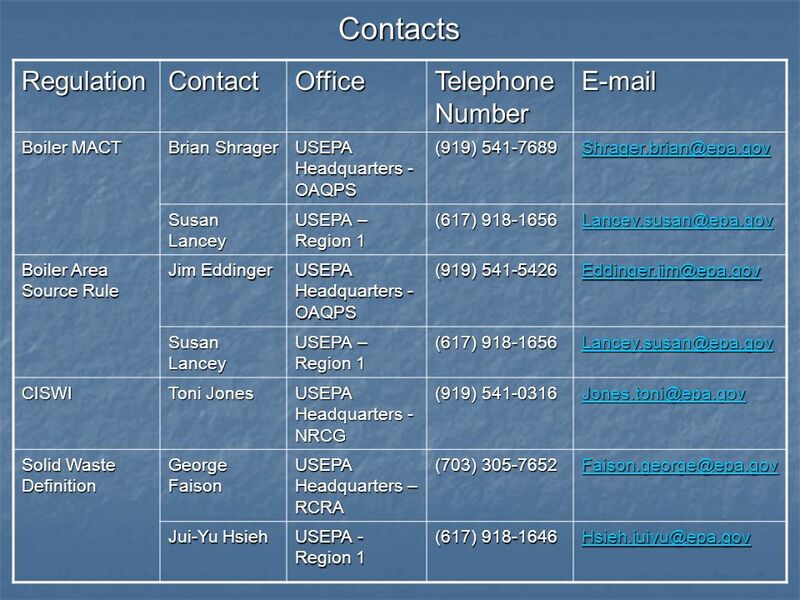 Rick Soucy GZA GeoEnvironmental, Inc. Managing Air Quality Data 101 Presented by: Chris Bellusci (GeoEngineers) & Claire Lund, PE (Sanborn Head) International Conference for Environmental Data. CLEAN AIR FOR LAGOS STATE Presentation by ENVIRONMENTAL LAW RESEARCH INSTITUTE (ELRI) AND GAMMA GAS DETECTION & MONITORING LIMITED (GAMMA GAS) TO SELECT.